"I love Indian food, this recipe developed after falling in love with the dish at a small family owned Indian restaurant near my home. After tweaking a few things, I think I have come up with a great copy-cat version. The curry paste can easily be substituted with the mild version for those with more sensitive palates. Serve over Basmati rice. I hope it meets your liking. Enjoy!" Place half of the mango slices into the bowl of a blender with the coconut milk. Blend until smooth and reserve for later. Heat the oil in a large pot over medium-high heat. Stir in the curry paste, and cook until fragrant, about 1 minute. Add the chicken and shallot; cook until the chicken is done and the shallots have softened, about 5 minutes. Pour in the mango puree, and cook until heated through. 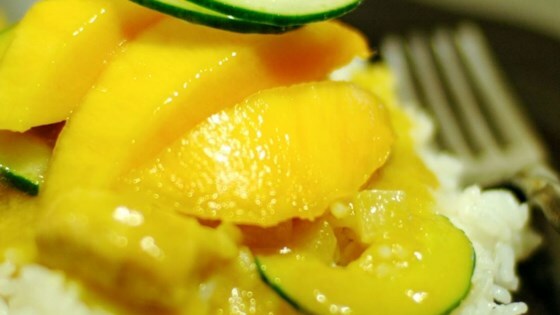 To serve, stir in the remaining mango slices and cucumber. Make a sensational Indian curry that’s both creamy and spicy. This was good but it needed something else. I added some ginger, cinamon, red pepper, and I sprinkled some sugar. That kicked it up! Due to the coconut milk and mango, this tasted more Thai than Indian. It was a little bland as is, so I added some Fish sauce until I liked the taste.